What Causes Metamorphic Rocks to Form? An erupting volcano is one of nature's most spectacular and breathtaking events. Few things demonstrate the power of Earth's natural forces more vividly than a volcano's flying rocks, flowing lava and ash clouds rising miles into the sky. Nobody really knows how many active volcanoes there are in the world, because many have not erupted in many years and others lie unknown deep under the oceans. The top surface of the Earth is called the crust. Less than 20 miles thick, it sits on top of a layer of molten rock and gas called magma. The crust is made of huge pieces called tectonic plates that fit together like a puzzle, but heat and pressure from the Earth's core make them move slowly against each other, forming cracks in the crust. 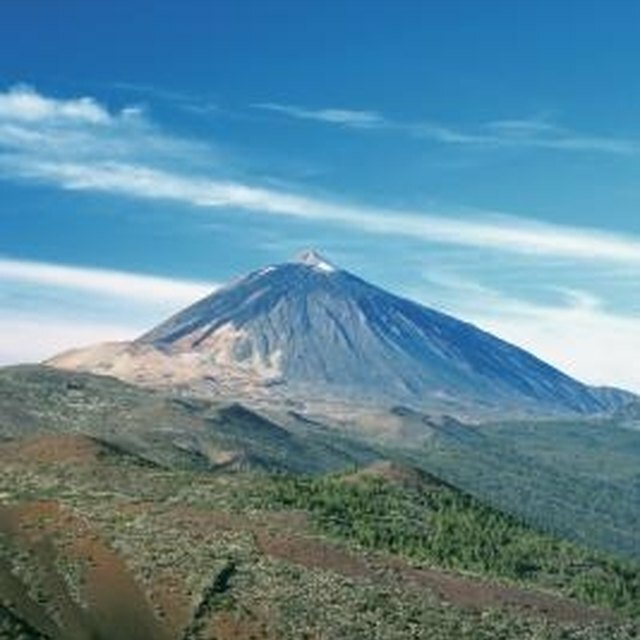 A volcano is a mountain located on a crack in the crust, opening into the pool of magma beneath it. When heat from deep inside the earth creates enough pressure, magma and gases push up through the opening and erupt from the volcano, spewing ash, steam, rocks, and molten lava into the air. 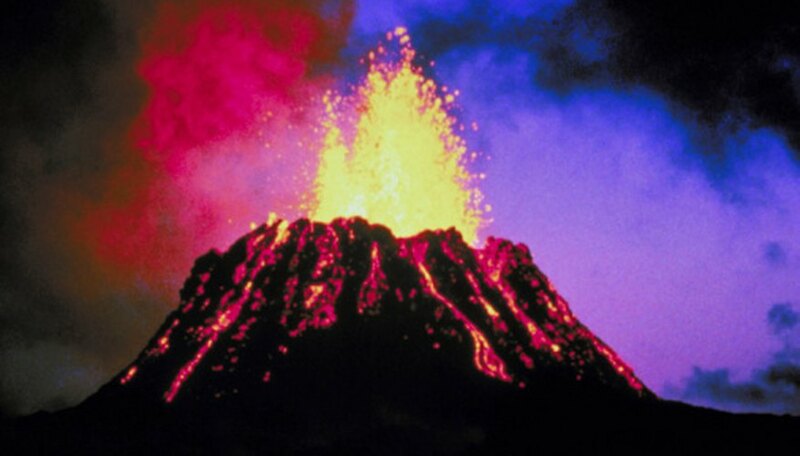 The molten or liquid rock inside a volcano is called magma. Magma is made mostly of rock and gases, but sometimes contains suspended crystals. Magma flowing out of a volcano during an eruption is called lava. 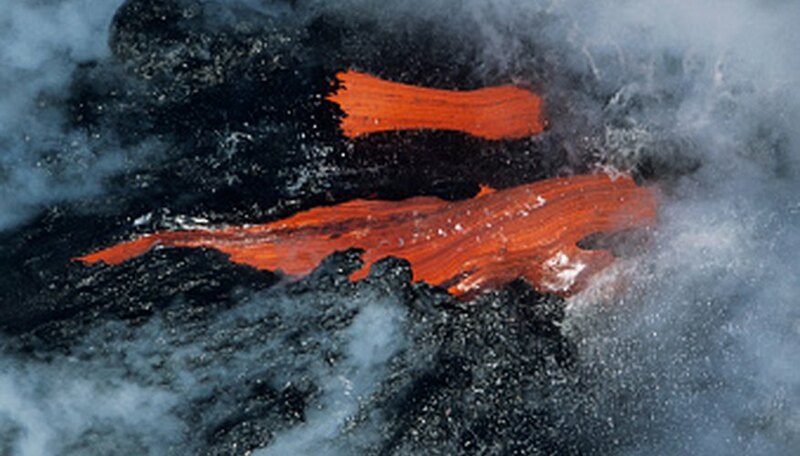 Lava is very hot, sometimes more than 2,000 degrees Fahrenheit, and it glows red or white hot as it flows. Lava turns into volcanic rock when it cools. Some lava from Hawaii's Kilaeua volcano flows to the ocean where it cools, hardens into rock and makes the island bigger every year. Like other mountains, many volcanoes have snow, ice and sometimes glaciers on their slopes. Heat from an erupting volcano can melt the snow and ice. When the melted snow mixes with rocks and ash from the volcano it creates a huge, dangerous mudflow called a Lahar. Lahars move far too fast for anyone in their path to outrun them. They usually flow down valleys and river beds and are destructive and deadly if they flow into a populated area or town. 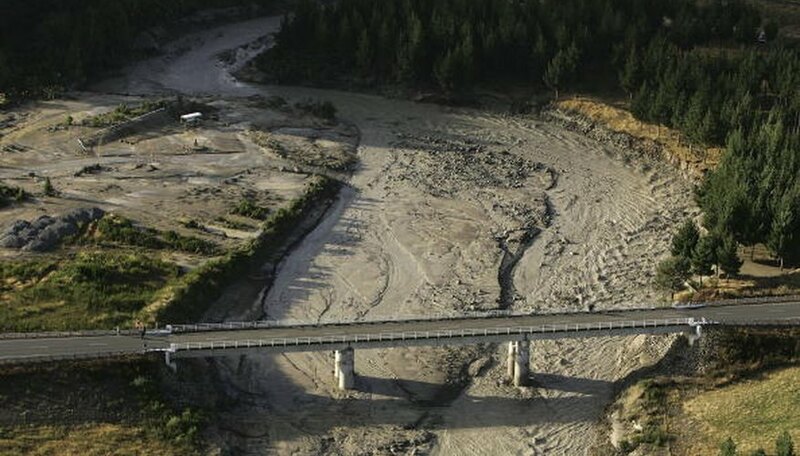 In 1985 lahars from the Nevad del Ruiz volcano in Columbia buried the entire town of Armero, killing over 20,000 people. 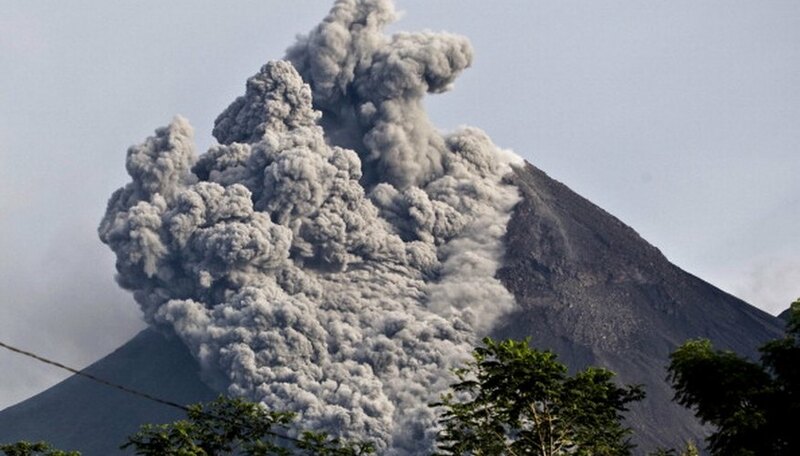 Some erupting volcanoes produce a mixture of extremely hot gases and rock called a pyroclastic flow. Pyroclastic flows look like giant dirty clouds that sweep down the sides of the volcano and destroy everything in their path. They can reach temperatures of over 1,000 degrees Fahrenheit and move faster than 400 miles per hour. Pyroclastic flows travel many miles away from the volcano and can even travel over water. The heat from a pyroclastic flow can melt snow and ice and create a lahar. The eruption of Mount St. Helens in 1980 literally blew the top off of the mountain. Mount St. Helens is now 1,300 feet shorter than it was before the eruption. Not all eruptions are violent and scary, but they can still be dangerous. Sometimes an eruption is just steam and ash billowing from volcano. 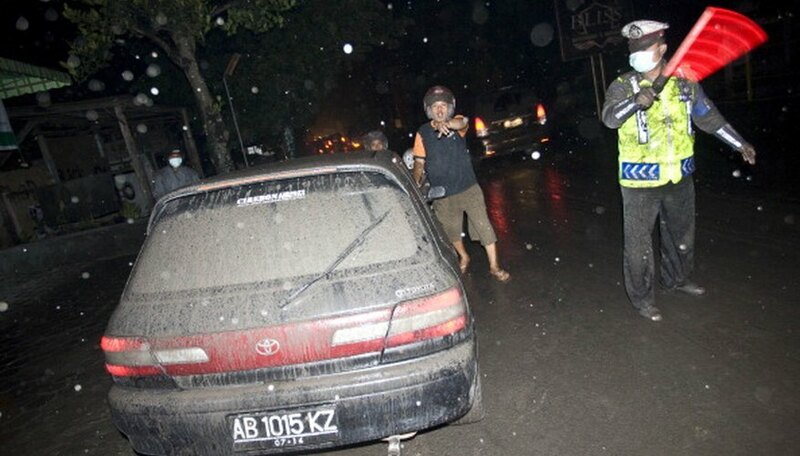 But volcanic ash is made from crushed rock and can make people sick. 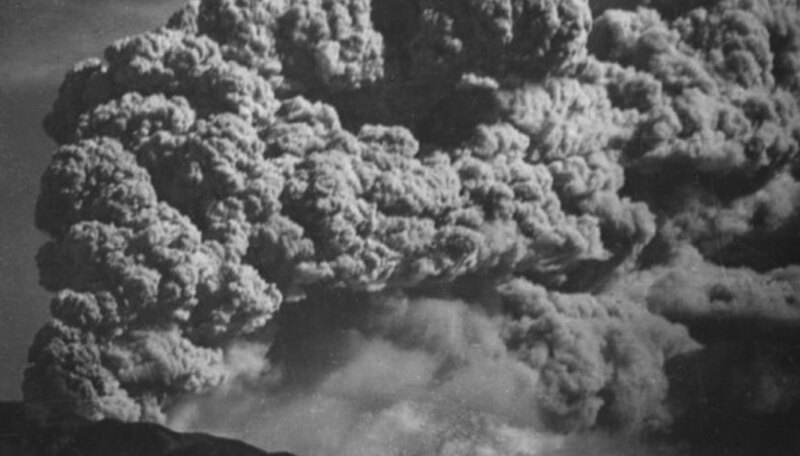 Volcano eruptions can change the weather. The ash in the air can make travel around the world, blocking sunlight and making temperatures cooler for months. What Are the Types of Volcanic Activity That Do Not Involve the Eruption of Lava? What Happens to Lava After Erupting From a Volcano? Donald, Doug. "Facts on Volcano Eruptions for Kids." Sciencing, https://sciencing.com/volcano-eruptions-kids-8214252.html. 24 April 2017.